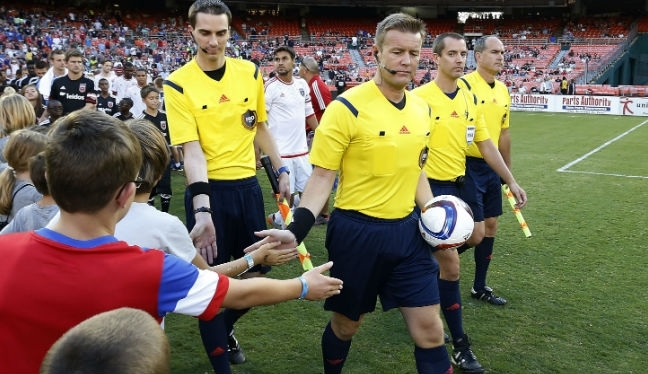 Alan Kelly has praised his PRO colleagues for the role they have played in him being voted MLS Referee of the Year 2015. After only his second season in MLS, Kelly picked up the award ahead of Jair Marrufo and Baldomero Toledo, having been assigned to 21 regular season matches – the second highest on the PRO roster in 2015. The center referee spoke of his delight at receiving the award, which was voted for by media, MLS players and MLS club management, but paid tribute to his fellow PRO officials. “I feel very privileged, very honored and very proud,” he reflected to proreferees.com “Individual honors and awards are not something that I strive for but am very appreciative of. “There is a really good work ethic and sense of professionalism among the match officials and we push each other to improve and learn from each game. All of those guys are as deserving of this award. Kelly, who hails from Ireland, has refereed in the European Champions League and World Cup qualifiers, and is a six-time winner of the Referee of the Year award in his native country. He moved to MLS ahead of 2014 and was a Referee of the Year finalist in his inaugural season, when Mark Geiger took the award. This time around he took the honors, after what he believes has been a good year, but knows there is always room for improvement. “The season has gone very well for me on the field and also from a learning and educational perspective. “There have been a couple of performances that could and should have been better. Taking the learning points from those games and actioning them has been gratifying. “I have enjoyed working with different match officials and learning more about MLS from those guys and each game. “That being said, the 2015 season is almost complete, so the plan is to relax and let the body recover and then start focusing on the 2016 season which I am certain will be just as challenging, if not even more so. While Kelly took the Referee award, Corey Parker was voted MLS Assistant Referee of the Year. As well as running the line for 19 MLS regular season matches, Parker made his FIFA debut in January at the 2015 CONCACAF Under-20 Championship, and Kelly believes he is deserving of the accolade. “During my career I have had the privilege of working with some fantastic ARs both in Europe and here in North America. “There are some incredibly experienced ARs here who have been in the league a long time and now you have a lot of younger guys who are relatively new to MLS who, having worked with them, have fantastic potential.